Mary Art Project curated an exhibition in Finland. Marianne Csaky (Hungary), Roxana Manouchehri (Iran/Ireland), Aurinna Marstio (Finland/UK), Gigi Scaria (India), Kiwoun Shin (Korea/UK), Heikki Takala (Finland) and Tiina Vehkaperä (Finland). Opening 1st April at 6-8 pm. This exhibition was proposed by me when I applied for the residency at Raumars. Since then, I developed my theme through several research on different culture, different material, different ideologies, as well as physical distance human being creates. 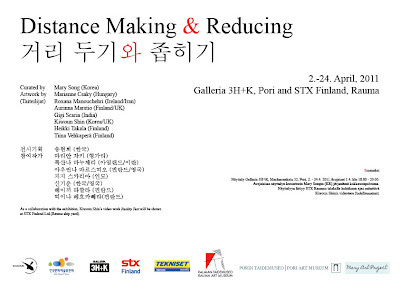 While I stay in Finland, I also contacted with local artists who are participating in the exhibition as well under the theme of Distance Making & Reducing. In this exhibition, there will be several video works by Csaky, Scaria, and Shin, those who went through National Studios of Changdong in Korea as well as Manouchehri who focuses on the gap between Persian tradition and modern life we live in. Csaky’s video Delete shows the way of deleting memories, and Shin’s series of grinding shows the process of this deleting or disappearing. Shin also participates Design Museum’s exhibition Korean design in Helsinki. Many of Scaria’s videos also show the contrast, especially social and architectural structures in his videos. Vehkaperä’s installation physically proves this contrast between two different distances when you try to look at yourself through her work. Takala’s sound project gives you this two different distances into more meditative and surreal level of ordinary life and its sound he creates or records. Marstio's dress pattern paper work shows the different aesthetics of using the same material in a sculptural way. A lot of her works are also related to nostalgia, which is a huge distance about our time, the past, when we have lived already. The distance human being makes is amazing. Not just about physical distance, but mental distance as well as emotional distance. This distance sometimes creates such a huge misunderstanding of what the other side is or has. In many cases, artists are trying to reduce this distance through their artwork, however, you sometimes have to create your own distance to look things better especially for a proper perspective towards a certain thing. Associated with the exhibition, there will be artists' lectures at Rauma city library on 6th, 13th, and 20th April, 2011. As a collaboration with the exhibition, Kiwoun Shin's video work Reality Test will be shown at STX Finland Ltd, Rauma shipyard. 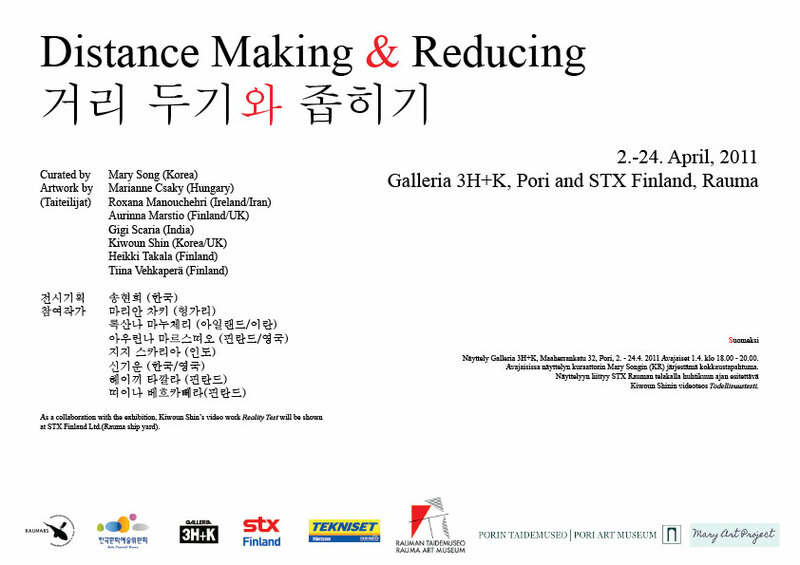 The exhibition is supported by Arts Council Korea and STX Finland Oy, Rauma shipyard. Thanks to Tekniset Mäntynen , Pori Art Museum, Rauma Art Museum and Raumars A-i-R.